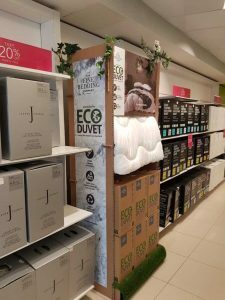 A LEADING retail display solutions specialist has provided eco-friendly merchandise platforms to promote the first-ever duvet made using 100 per cent renewable materials in flagship Debenhams stores. Ripple has designed and manufactured display solutions for the Eco Duvet, a revolutionary quilt made by the Fine Bedding Company. In keeping with the environmental credentials of the product, the in-store display and merchandising platforms are also made from 100 per cent recycled or recyclable materials. 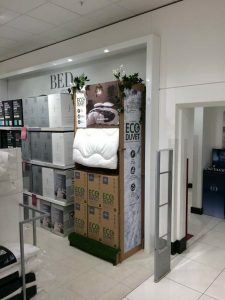 The Eco Duvet stands were unveiled recently at Debenham’s flagship stores in London’s Oxford Street, Bristol and Bath. 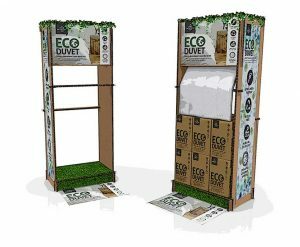 Richard Clark, Key Account Manager at Ripple, said: “In line with the Eco Duvet and its packaging, the client provided us a brief to design and manufacture a display concept aligned to the eco-values of their product. Ripple Sales Director Hannah Wolfenden said the team was delighted to work on another project with The Fine Bedding Company, which has a strong heritage and innovative outlook to manufacturing. Based in Trafford Park, Greater Manchester, the bedding company originally specialised in supplying cruise liners and ships with luxurious bedding products. In more recent years, it has gained a position of providing premium bedding sold through leading high street retailers. The new Eco Duvet has micro-fine fibre fillings made totally from recycled polyethylene terephthalate (PET) plastic bottles. A 10.5 tog double-duvet is made from around 120 recycled bottles. The bedding company transforms waste materials that would otherwise be sent to landfill sites. The duvets are hypoallergenic, breathable, home-washable at the energy-saving 30°C and quick-drying, creating a lower carbon footprint. Similarly, the Eco Duvet covers are also made from 100 per cent recycled materials while the packaging contains recycled and recyclable materials. The Fine Bedding Company uses 100 per cent renewable energy at its award-winning eco-factory in Trafford Park. Its products include pillows, protectors, mattresses and accessories for the Fine Bedding Company and Nimbus brands. Ripple works across the UK and Europe and is part of Ripple Group. Led by managing director David Wolfenden, its design operation and diverse manufacturing base are in Oldham, Greater Manchester. 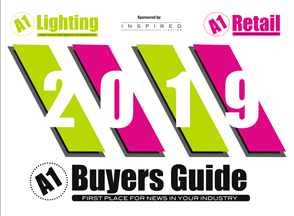 Ripple works across interior and display services in retail sectors including fashion, grocery, sport and leisure, entertainment, cookware, health and beauty, DIY and builders’ merchants, department stores, home décor, electricals and technology. Brands and retailers that Ripple works with include Akzo Nobel and Dulux Decorating Centres, Trespass, Majestic Wine, B&Q, Cheshire Mouldings, Boots, Topps Tiles, Marshalls, B&M and Energizer. 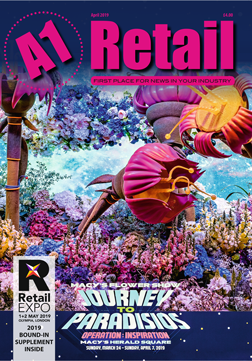 Ripple primarily focuses on retail environments and product displays, but extends the offer to showroom, theme park, visitor centre and museum projects.